This Weekend! Sugarloaf Crafts in Oaks, PA! Plan, Preview & Get Tickets 20% Off Today! Sugarloaf Crafts is in Oaks, PA this weekend! We want to see you when we arrive March 15-17 at the Greater Philly Expo Center. Get excited to meet and shop from 275+ talented artists. Art, home decor and furniture, fashion, jewelry and much more! Plus, take a FREE painting class, watch live glassblowing and sample special foods. Make your plans, bring the kids and have a fun time at the festival! Step into the studio with Sugarloaf's Kathy Small to create a masterpiece to take home with you. Space is limited at Sugarloaf's FREE Painting Classes! Check the schedule, and sign up when you get to the show. Do they really make that? YES! See art comes to life with expert artists this weekend at Sugarloaf Craft Festivals. Glassblowing, woodturning, metal-spinning, pottery and more. Located throughout the festival all weekend, we know you'll love watching the artistic process. Known best for her hand-pigmented "dragon-hide" pieces, PA leather artist Melanie Zellner makes sure all of her work is extraordinarily out of the ordinary! Come check out her collection of leather accessories, garments, bags, and boxes this weekend at Sugarloaf. Local fine jewelry designer Marthe Roberts-Shea describes her jewelry's style as "big, bold, and screaming for attention," while other creations take on a more subtle presence. Stop by this weekend and say hey! 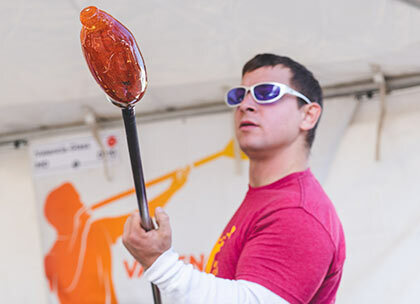 Sugarloafer Phil Valencia has a passion for showing off his skill as part of his live glassblowing demonstration. Stop by his booth this weekend and see art come to life, from a lump of molten glass to an ornate, completely one-of-a-kind treasure. Start making your shopping plans with Sugarloaf's Shopping Guide! From jewelry to fine art, clothing, specialty foods and more, peruse featured exhibitors and exclusive deals. Meet them in person this weekend! Click through for more. We can't wait to see you this weekend at the Greater Philly Expo Center this weekend for a fun filled Sugarloaf Crafts Festival. Follow @SugarloafCrafts on Facebook, Instagram and Twitter for more of the talented artisans you love. See you at the show! This Weekend - Sugarloaf Crafts in Edison, NJ - Tickets 20% Off Today! Meet 250+ Artists! Get excited! Sugarloaf Crafts returns to Edison, NJ this weekend! Join us March 1, 2, 3 for a special shopping festival at the NJ Conv. & Expo Center (Raritan). 250+ talented artisans are excited to meet you and show you their latest works. From art, fashion, jewelry, home decor and specialty foods to live art demonstrations and kids' theater, there's something for everyone at Sugarloaf. Bring your friends, bring the family - we can't wait to see you at this one-of-a-kind event! Sugarloaf's Shopping Guide features can't miss shopping! Find inspiration for Mothers Day, Graduation and Wedding gifts, plus something special for you! Get to know 250+ of Sugarloaf's artists this weekend. These talented folks have been hard at work on new creations and are excited to share them with you. Preview the show and start making your "must-see" list! Mark Stanley uses oak, maple, walnut, and even plywood to shape his sleek sculptures. Stop by and say hi this weekend! Glassblower Danny Polk has new creations waiting for you at Sugarloaf. Each piece is personal and unique, see his art this weekend and take home something special. NJ-based photographer Ed Roberts channels his zen during his hours in nature. Come check out his artistry and find your own peaceful easy feeling. Follow @SugarloafCrafts on Facebook, Instagram and Twitter for more of the talented artisans you love. See you this weekend. Back for another incredible tour in 2019, we're excited to have you join us in Edison! Sugarloaf Crafts returns to Chantilly, VA this weekend for 3 days of one-of-a-kind art and fine craft holiday shopping. Dec. 7-9, don't miss out! 350+ of the country's most talented artisans have unique gifts and handcrafted products you can't find in stores. Bring your list, check it twice, and plan to #ShopSugarloaf this holiday! Tickets 20% off today! Plan Your Holiday Shopping at Sugarloaf Crafts! Wrap up on your holiday shopping! Check your gift lists twice and take advantage of Sugarloaf's Shopping Guide to find the perfect gifts for everyone. Glass artist Pamela White wraps up her first Sugarloaf Tour in Chantilly. Her "lifestyle" pieces add a subtle flare to any appetizer - perfect for serving your holiday guests! See forgotten gems in a different light with Kyle Wilson's fine art photography. 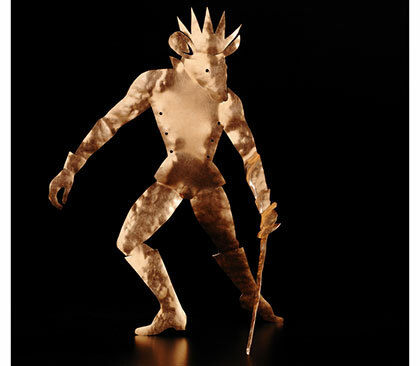 His modern techniques spark new memories in long-lost works of art. Stop by his booth this weekend and see his amazing scenes in person. 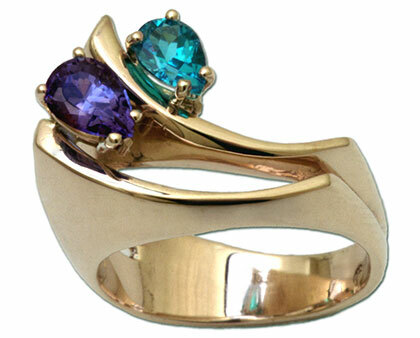 Michael Alexander's use of colorful gemstones brings a certain understated brilliance to his jewelry designs. Whether you're still shopping for a holiday gift or looking to treat yourself, Michael can help you find the perfect piece - sure to bring a smile for years to come. We can't wait to see you for one last handmade shopping experience this weekend in Chantilly, VA. Help us ring in the holiday season in style! Keep in touch - follow us @SugarloafCrafts on Facebook, Instagram and Twitter for all things Sugarloaf. See you this weekend! Sugarloaf Crafts returns this weekend to the Mont. Co. Fairgrounds in Gaithersburg, MD. Nov. 16-18, join 350+ talented artisans from across the country at this one-of-a-kind experience. Get started on your holiday lists and #ShopSugarloaf for the most unique gifts that you can't find online. Fashion, accessories, jewelry, sculpture, home goods, fine art, specialty foods - you'll find it all! Buy your tickets now and start making your plans. We can't wait to see you! Plan Your Shopping Excursion to Sugarloaf Crafts! Start your holiday shopping! Check out Sugarloaf's Shopping Guide to find the perfect gifts for everyone. Looking to reconnect with your favorite artists? Searching for a few new ones? Join us this weekend and see the nation's most talented designers and creators. Here's a sneak peak at some of the talent waiting for you in Gaithersburg. Metal sculptor Carrie Fertig hand hammers and torches her metal designs into perfection. From subtle and sleek to abstract and extravagant. Plus great ornaments! Shop her work this weekend. James Saunders' love of woodturning is only matched by his love for sharing his work with the world. His work will be a happy gift or joyous addition to your home. Check him out this weekend! 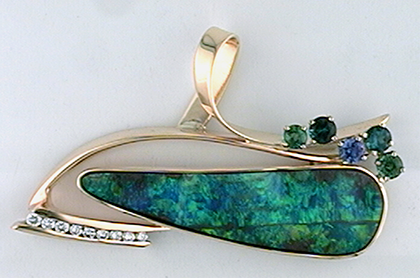 Shimmering sterling silver is a staple of jewelry artist Diane Wright. For special sparkly gifts, stop by this weekend! We're excited to be back in Gaithersburg at the Mont Co Fairgrounds and hope you'll join us for another fun-filled weekend of shopping and good company. Keep in touch - follow us @SugarloafCrafts on Facebook, Instagram and Twitter for all things Sugarloaf. See you this weekend! Sugarloaf Crafts this Weekend - Oaks, PA: Preview + Discount Tix + FREE Painting Class! Sugarloaf Crafts is on its way for you! This weekend for 3 days only, Nov. 2-4, #ShopSugarloaf at the Greater Philly Expo Center in Oaks, PA. Find unique products and gifts by 350+ talented artisans at this special event. All things high quality and handcrafted, Sugarloaf is your go-to for holiday shopping and more! Sample specialty foods, try a FREE painting class, and entertain the kids with dress up theater. Don't miss out! Tickets on sale - 20% off today! Plan your weekend excursion with Sugarloaf's Shopping Guide! From jewelry to fine art, clothing, specialty foods and more, Sugarloaf truly has something for everyone. Start shopping for the holiday season! Step into the studio yourself! Enjoy Sugarloaf's FREE "Learn to Paint" classes this weekend with Sugarloaf fine artist Kathy Small. Create a memory to take home with you. Check the schedule and sign up at the show! Ready to see your favorite artists and their latest work? Looking for something different from a new Sugarloafer? Take a look at just a small sample of what's waiting for you in Oaks. 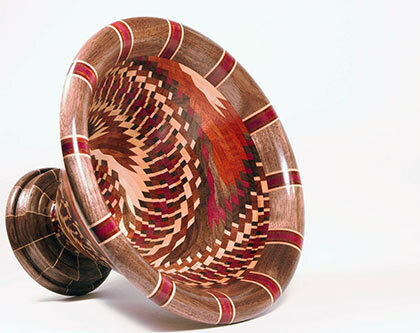 Tyler Lucas' exquisite wood turnings will take your holiday parties to the next level. His cutting boards, pepper mills, and serving bowls are sure to wow your guests; stop by his booth this weekend and see his amazing work in person. Jewelry designer Barbie Levy's "Barb Wire" combines color, balance, geometry, and clean lines to create a light and contemporary look. Like all Sugarloafers with wearable art, she loves seeing her work brighten and elevate any outfit. Using a proprietary process to add color Jennifer Cherpock creates a marbling effect in her ceramics. The organic swirls are meant to inspire feelings of peace and serenity. We're ready for another wonderful weekend of handmade shopping at Sugarloaf Crafts in Oaks, PA. Keep in touch! Follow @SugarloafCrafts on Facebook, Instagram and Twitter for Sugarloaf's latest news. See you this weekend! Artists - Apply Now! Fall '18 & Spring '19 Tours - A Few Spaces Left! Sugarloaf's Spring '19 Tour jurying has begun! Hundreds of artists and craftspeople have already applied and we're excited to welcome new members to our creative community. Limited space remains for both Fall '18 and Spring '19. Tell your artist friends to apply today! Start planning your shopping experience now. Customized shopping guides are available for each show. Meet these talented Sugarloaf artisans on our next tour! Hannah Long creates organically-inspired jewelry with a bohemian flair by fusing fine metals with gemstones. Each piece is handmade in her studio; many featuring stones hand cut by Hannah herself! Stop by her booth this fall to see her designs up close. Terrianne Taylor started creating soaps and lotions after rediscovering recipes in a family cookbook. She tells the story best herself - click the image below to hear the humble start of Pretty Baby Naturals. Everyone appreciates an artist of amazing talent who doesn't take themselves too seriously; self-taught Sugarloafer Bruce Garrabrandt is just that! Whether you want a traditional drawing or something more whimsical, he's happy to create whatever your heart desires. Keep in touch with @SugarloafCrafts on Facebook, Instagram and Twitter! Enjoy the summer as Sugarloaf recharges for another record-breaking fall tour. See you soon! Artists - Spring '19 Applications - Deadline 7/30! Dive in to Sugarloaf Craft Festivals' Spring 2019 Tour! 5 Top Shows in PA, VA, MD and NJ. Sugarloaf provides a springboard and a platform for new or emerging craftspeople to grow their business. Don't be shy - new artists and crafters are always encouraged to submit an application. Deadline for applications is July 30th - Apply Today! Meet these talented artists this fall at a Sugarloaf Craft Festivals! High Strung Studios' Jennifer Woods gives guitar strings a second life as integral parts of her jewelry. Guitarists from across the country donate their strings to be upcycled into bracelets, necklaces, and earrings. Jennifer joins us at all 6 tour locations this fall - come check her work out! Ceramic artist Roxie parent creates quirky and functional clay vases, platters, cheese spreaders, and more. 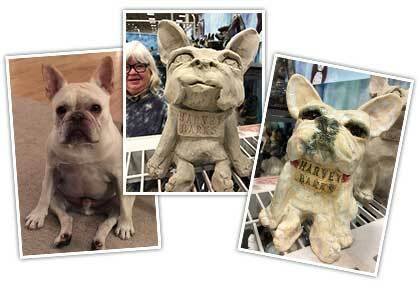 Stop by her booth to see her work take shape - she'll be doing live demonstrations at all 6 fall shows. Another live demo performer at Sugarloaf is metal spinner John Akkus. Using an ever-evolving set of skills, he expertly crafts metal bells, bowls, and wall hangings. Keep in touch with @SugarloafCrafts on Facebook, Instagram and Twitter! Enjoy the summer relaxation as Sugarloaf builds another great tour. We'll see you this fall! Sugarloaf Crafts returns this weekend to the Mont. Co. Fairgrounds in Gaithersburg, MD. April 20-22, have fun shopping from 275+ talented artisans. Find a new spring style and spruce up the house with things unique and special. Jewelry, pottery, fashion, fine art, photography, furniture, decor and more! Sugarloaf is one-stop shopping for Mothers Day, Graduations and Weddings. Bring the kids, they'll love the dress up theater! Tickets 20% off today! Sugarloaf's Gift Guide has something special for you! Browse and start planning your shopping. Click through for featured exhibitors and exclusive deals. With new exhibitors and returning favorites, it is always an exciting and inspiring weekend at Sugarloaf Crafts! Browse the show and get ready to meet more than 275 talented artisans. Read on for special highlights! Feel the spring vibes with these bright and happy handbags by Mercedes Sherwood Designs. 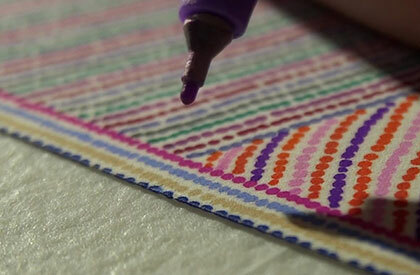 Artist Constance Scott uses vintage barkcloth to create her original designs. Stop by and find your favorite this weekend! There's always something to new to see at sculptor Dana Smallwood's booth! From whimsical to functional, you'll love this creative work. Come say hi to Dana this weekend at Sugarloaf Crafts. The grace and beauty of Grateful Gathers Glass is undeniable. Organic movement and bright colors make each piece special. Find a great addition to your home, or a perfect gift. This weekend! 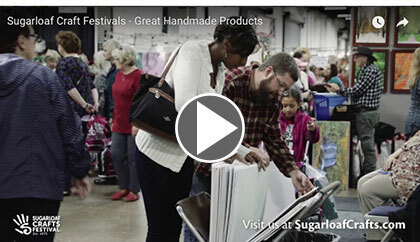 We can't wait for a fabulous Sugarloaf Crafts Festival at the Montgomery County Fairgrounds in Gaithersburg, MD. Keep up to date on all things Sugarloaf. Follow us, @SugarloafCrafts on Facebook, Instagram and Twitter. See you this weekend! Sugarloaf Crafts Comes to MD in April! Spring has sprung! Sugarloaf Craft Festivals is arriving with 2 fresh and fantastic shows this April. Join us in the DC and Baltimore areas. Find special and unique Mother’s Day, graduation and wedding gifts, plus treats for you. Shop from hundreds of talented artisans, sample yummy small batch foods and watch live art demonstrations. The kids will love the free dress up theater. Something for everyone! Click through to preview the shows, get directions and buy your tickets! Artist Previews - Get Inspired! There are so many amazingly talented artisans to meet at every Sugarloaf Crafts Festival. Peruse the participating artists in Gaithersburg and Timonium. Get excited to meet and shop from some awesome artisans! Watch art come to life before your eyes! Master stone sculptor Marty Silverman shares his gift at Sugarloaf Crafts. Using marble, granite and other stone selected for organic beauty, you’ll fall in love his work. Each piece is a one-of-a-kind! Meet Marty at Sugarloaf. Show your USA pride with a handcrafted flag by Flags of Valor. 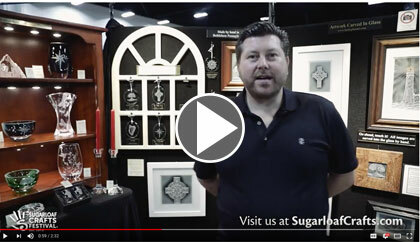 Veteran owned, operated and made, support these American artisans at Sugarloaf Crafts. Take home a meaningful piece you’ll love for years to come. Travel through Europe without leaving home! David Maynard’s La Shot Photography will transport you to magical places near and far. Meet David and take a trip this April at Sugarloaf. Follow @SugarloafCrafts on Facebook, Instagram and Twitter to keep up on the latest news! We are can’t wait to see you at two fabulous Sugarloaf Craft Festivals this month. Sugarloaf Crafts THIS Weekend in Chantilly, VA! 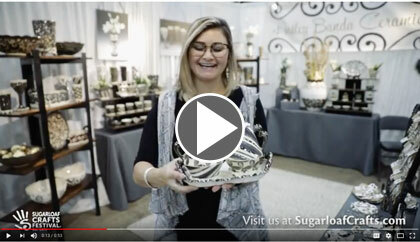 Sugarloaf Crafts is BACK this weekend at the Dulles Expo Center in Chantilly, VA. March 23-25, join in the fun and shop from 300+ talented artisans. Find a new spring style or spruce up the house with the most unique and special handcrafted items. From jewelry, pottery, fine art, photography, furniture and decor to fashion and accessories, Sugarloaf is one-stop shopping for Mothers Day, Graduations, Wedding gifts and more! Don't miss our exclusive FREE painting classes and take home your own artwork. Tickets 20% off today! Sugarloaf's Gift Guide has something special for everyone. Browse and start planning your shopping. Click through for featured exhibitors and exclusive deals! Channel your inner Picasso and learn to paint this weekend with fine artist Kathy Small. 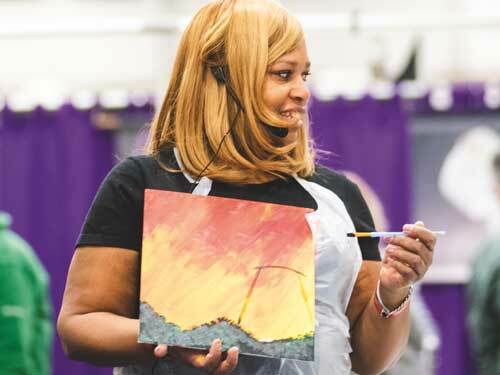 Enjoy Sugarloaf's FREE Painting Classes and create a masterpiece and a memory to take home with you. Check the schedule and sign up at the show! Who are you most excited to see this weekend? Browse the show and get ready to meet more than 300 talented new and returning artisans. Read on for some special highlights! Give your home a pop of spring color with Dee Miller's vibrant wooden flowers and vases. Create a custom arrangement with your favorite blooms! A great Mother's Day gift that will last all year long. Stop and smell the roses this weekend at Sugarloaf! 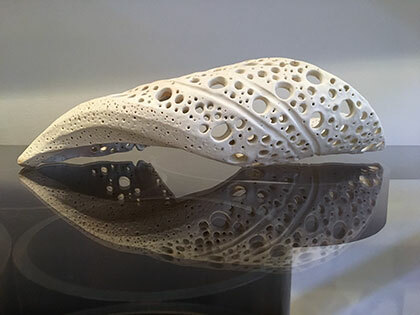 Adam and Sarah Spector bring unique talents and perspective to their work, and the results are incredible! You'll love their functional and decorative ceramics and sculpture, and custom orders are available. A must-see at Sugarloaf this weekend! Rona Fisher fine jewelry proves that all that glitters IS gold! And diamonds, fine gems, and other precious metals. Rona's designs are sparkly and timeless. Find your favorite pieces this weekend at Sugarloaf Crafts. Sugarloaf Crafts THIS Weekend in Oaks, PA! Sugarloaf Crafts is SO excited to arrive THIS weekend at the Greater Philadelphia Expo Center in Oaks, PA. March 16-18, enjoy shopping from and meeting 250+ talented artisans at this special event. All things high quality and handmade, Sugarloaf is your go-to for Mothers Day, Graduations, Wedding gifts and more. Sample specialty foods, learn to paint at a free painting class, and entertain the kids with dress up theater. Stop by the Info Booth for a shopping bag! Tickets 20% off today! Start making your shopping plans with Sugarloaf's Gift Guide! From jewelry to fine art, clothing, specialty foods and more, peruse featured exhibitors and exclusive deals. Then meet them in person this weekend! Click through for more. Step into the studio with fine artist Kathy Small this weekend with Sugarloaf's FREE Painting Classes! Create a masterpiece and a memory to take home with you. Check the schedule here, and get ready to channel your inner artist! What kind of products and artwork will you find at Sugarloaf Crafts? Hear from our exhibitors what you can expect! You'll have a chance to meet 250+ talented artisans this weekend. Take a sneak peek at some of our favorites, and preview the show here. Time for Spring cleaning! Get fresh from head to toe with all natural personal care products by Pretty Baby Naturals. Stock up on your favorites. Watch to learn how soapmaker Terrianne Taylor got her start, and meet her this weekend! Brian Delozier's artwork is made up of hundreds of thousands of individual dots. 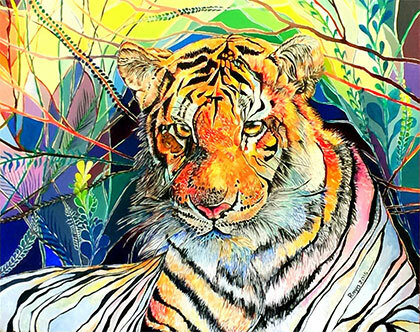 Using fine-tip Sharpie markers, his intricate work will make you smile and leave you in awe. Stop by this weekend to say "hi" and watch him work on his next masterpiece. 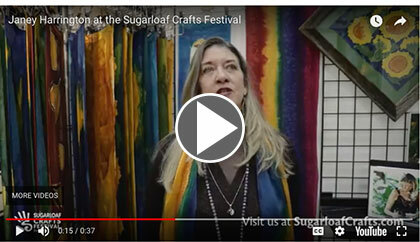 We can't wait for you to be a part of a great Sugarloaf Crafts Festival in Oaks, PA. Follow @SugarloafCrafts on Facebook, Instagram and Twitter for more of the talented artisans you love. See you this weekend! 2 Festivals this Month! Shop Artist Direct + FREE Painting Classes! Finally, March is here! Sugarloaf Crafts Festival offers you 2 more chances this month to experience this special handmade shopping event. For the most unique products you can't find anywhere else, shop Sugarloaf at our Festival in Oaks, PA near Philadelphia and Chantilly, VA in the DC area this month. Spruce up your home and your style for spring, plus find special gifts for Mothers Day, Graduations and Weddings. Early bird tickets are 20% off today! Spring Special: FREE Painting Classes! Step into the studio! Take a free painting class at Sugarloaf's Oaks and Chantilly Festivals. Learn from Sugarloaf artist Kathy Small in this fun free workshop. Create your own masterpiece to take home. Space is limited. Sign up at the shows! There are so many amazingly talented artisans to meet at every Sugarloaf Crafts Festival. Peruse the participating artists in Oaks and Chantilly, and check out awesome artisans! Silk painter Janey Harrington can't wait to share her passion for her art with you! Combining two passions, textiles and painting, her vibrant work is both delicate and durable. Watch to learn more! Husband and wife team Helen and Allen Weichman create work that is sure to make you smile! Stop by for a live demonstration and watch their whimsical sculptures and functional products come to life. Pro tip: Custom orders are available! Check out Paul and Irma Miller's "Amish-fusion" high quality wood furniture. Designed to last, this furniture will be the centerpiece of family fun and gatherings for many years to come. Learn more about Paul & Irma Miller and their thriving family business! Follow @SugarloafCrafts on Facebook, Instagram and Twitter to keep up on the latest news! 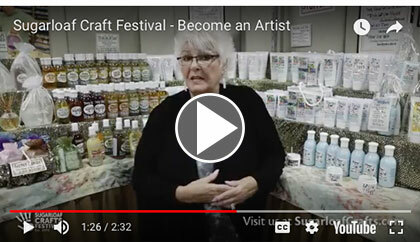 We are excited to see you at Sugarloaf Craft Festivals this month. Sugarloaf Crafts in Edison, NJ THIS Weekend! This weekend! Sugarloaf Crafts Festival arrives in Edison, NJ at our NEW venue, the NJ Convention and Expo Center. March 2 - 4, get your friends together and bring the kids! Shop a curated collection of 250+ talented artisans for the most special products you won't find in stores. Browse high quality handmade decor and furniture, fine art, jewelry, fashion, photography and more. Sample specialty foods and enjoy the free kids show. Something for everyone! Stop by the info booth for coat check and a FREE shopping bag! Sugarloaf's Gift Guide is can't miss shopping! Find inspiration for Mothers Day, Graduation and Wedding gifts, plus something special for yourself and your home. Click through for featured exhibitors and exclusive deals. You'll have a chance to meet more than 250 talented artisans this weekend. Take a sneak peek at some of our favorites! Elaine Thompson's whimsical paintings and prints are sure to brighten your day. Take a peek now at what inspires her work, and stop by to say hello this weekend. Stop by Ice Box Jams this weekend for a free sample of classic and seasonal flavors of their frozen jams. So much healthier - and tastier - than anything you'll find in stores! Learn more about how this NJ-based family business got their start. Looking to smile? Then you must meet jeweler Ricky Boscarino this weekend at Sugarloaf Crafts. His whimsical designs are truly one of a kind. Watch to see him talk about some of his favorite designs! Follow @SugarloafCrafts on Facebook, Instagram and Twitter for more of the talented artisans you love. See you this weekend. We are so excited to kick off our Spring Tour with you in Edison, NJ!